You can also view transactions by coded lines i.e. group all animal health transaction lines together. 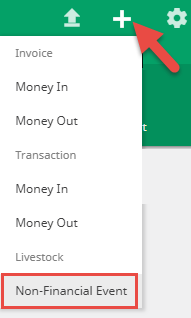 All transactions are sorted by date order to easily check that the Focus balance matches with your actual bank balance. Each transaction indicates if it was brought in through a Bank Feed or a manual import, and whether it has been coded or not. To record a non financial stock event, you’ll need to go back to the Needs Action area. The Needs Action area is made up of two sections; Invoices and Bank transactions. Record information about bills, tax invoices and credit notes due to move through your farm bank account. If you're Invoice basis for GST, you'll also use this section to record all invoices for your GST returns. Invoices are matched to bank transactions. Check out how to record an invoice for more information.